Are you looking for a wild ride to take you through the streets of Doral, Kendall, Hialeah, and Miami? If so, you need a vehicle with rugged capability that can get you where you need to go — even if you encounter some hazards on the road. Don’t think this rugged capability means you need to sacrifice interior space and quality either, because there’s one SUV that offers the best of both worlds. The new 2019 Toyota 4Runner is a brilliant choice for anyone looking for a vehicle suitable for adventure and everyday drives. With numerous features you’re sure to enjoy, this might just be the vehicle you’ve been looking for. Learn more about this rugged SUV in our comprehensive 2019 Toyota 4Runner review. Capability Off-road challenges are easier than ever when you’re behind the wheel of a 4Runner. There are two 4-wheel-drive systems available, and both work well for tackling rough terrain. The part-time 4WD system comes with active traction control, but the full-time 4WD system features a limited-slip center differential and locking rear differential for greater control and maneuverability. You’ll also find the Multi-terrain Select system inside the 4Runner that lets you cycle through four distinct driving modes on a scale from light to heavy terrain. This will allow you to regulate wheelspin automatically to ensure you always get the traction you need. Additionally, the Kinetic Dynamic Suspension System and Crawl Control work to provide optimal traction as well. Interior With the 4Runner’s interior, you can bring the whole crew with you on your next adventure. The seats inside are crafted with available SofTex materials, which can even be upgraded to perforated leather on the Limited trim. As if that wasn’t enough, the front seats can be heated and ventilated, so you’ll always sit at your preferred temperature. Every inch of the interior was designed with the driver in mind. You’re surrounded by quality at all times, and that’s arguably exemplified best by the Optitron instrumentation. This expertly designed system makes it easy to read your gauges and access all your controls, day or night. 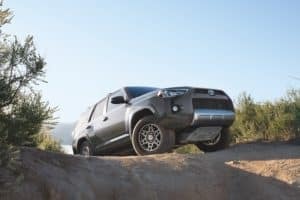 Technology As you might expect, the 2019 4Runner is also equipped with some of the most advanced technology on the market. The first thing you’ll probably notice is the 6.1-inch touch-screen interface for your infotainment system, but that’s just the beginning. You can also enjoy Bluetooth® wireless technology, which gives you access to your phone completely hands-free, so you can make calls and stream music. You can also opt for an integrated navigation system that gives you turn-by-turn directions in addition to HD Radio™ Predictive Traffic and Doppler Weather overlay. With that kind of information at your disposal, you’ll always be able to plot the best route to wherever you need to go. Test Drive the 2019 Toyota 4Runner in Doral FL! If you want to learn more about the 2019 Toyota 4Runner and everything else it can offer, head down to Doral Toyota. Our team is happy to help you discover whether or not you want to drive this bad boy through the streets of Doral, Miami, Kendall, and Hialeah. Schedule your test drive today! Are you looking for a wild ride to take you through the streets of Doral, Kendall, Hialeah, and Miami? If so, you need a vehicle with rugged capability that can get you where you need to go — even if you encounter some hazards on the road. Don’t think this rugged capability means you need to sacrifice interior space and quality either, because there’s one SUV that offers the best of both worlds. 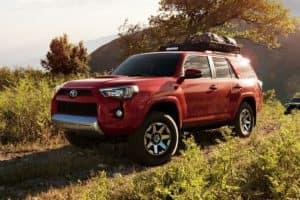 The new 2019 Toyota 4Runner is a brilliant choice for anyone looking for a vehicle suitable for adventure and everyday drives in South Florida. With numerous features you’re sure to enjoy, this might just be the vehicle you’ve been looking for. Learn more about this rugged SUV in our comprehensive 2019 Toyota 4Runner review. Off-road challenges are easier than ever when you’re behind the wheel of a 4Runner. There are two 4-wheel-drive systems available, and both work well for tackling rough terrain. 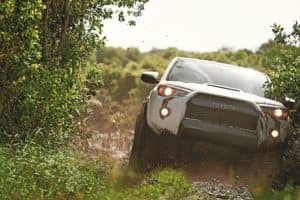 The part-time 4WD system comes with active traction control, but the full-time 4WD system features a limited-slip center differential and locking rear differential for greater control and maneuverability. You’ll also find the Multi-terrain Select system inside the 4Runner that lets you cycle through four distinct driving modes on a scale from light to heavy terrain. This will allow you to regulate wheelspin automatically to ensure you always get the traction you need. Additionally, the Kinetic Dynamic Suspension System and Crawl Control work to provide optimal traction as well. With the 4Runner’s interior, you can bring the whole crew with you on your next adventure. The seats inside are crafted with available SofTex materials, which can even be upgraded to perforated leather on the Limited trim. As if that wasn’t enough, the front seats can be heated and ventilated, so you’ll always sit at your preferred temperature. Every inch of the interior was designed with the driver in mind. You’re surrounded by quality at all times, and that’s arguably exemplified best by the Optitron instrumentation. This expertly designed system makes it easy to read your gauges and access all your controls, day or night. As you might expect, the 2019 4Runner is also equipped with some of the most advanced technology on the market. The first thing you’ll probably notice is the 6.1-inch touch-screen interface for your infotainment system, but that’s just the beginning. You can also enjoy Bluetooth® wireless technology, which gives you access to your phone completely hands-free, so you can make calls and stream music. You can also opt for an integrated navigation system that gives you turn-by-turn directions in addition to HD Radio™ Predictive Traffic and Doppler Weather overlay. With that kind of information at your disposal, you’ll always be able to plot the best route to wherever you need to go. Test Drive the 2019 Toyota 4Runner in Doral FL! If you want to learn more about the 2019 Toyota 4Runner and everything else it can offer, head down to Doral Toyota. Our team is happy to help you discover whether or not you want to drive this bad boy through the streets of Doral, Miami, Kendall, Hialeah and other South Florida areas. Schedule your test drive today!